Each element of your front-end design, including the dashboards, admin areas and so on, is very important, as is the appearance of your design. As you might be aware, a lot of effort and time goes into the entire design process. The point is your design process does not end with the front-end, but also applies to the user interface of the admin area, which is again time-consuming, because the whole process of designing the pages and layouts is applicable to the user interface of the admin area as well. Though the entire cycle of designing the front-end and back-end seems to be challenging, using the admin templates makes the development process of the user interface easier and quicker. These packages of templates comprise stylish, built-in templates and demos for the dashboards and admin pages. These inbuilt resources can be customized based on your project requirements. It offers certain predefined color schemes and other options for speeding up the development process. In fact, every essential aspect of the dashboards and admin pages are readily available within these template packages. If you are in search of a feature-rich Bootstrap admin template that will make your website look stunning, then you should take a look at the Equinox Bootstrap admin template. This excellent admin template is equipped with multiple numbers of handy UI elements and other components. These tools will enable you to easily build a good-looking website. 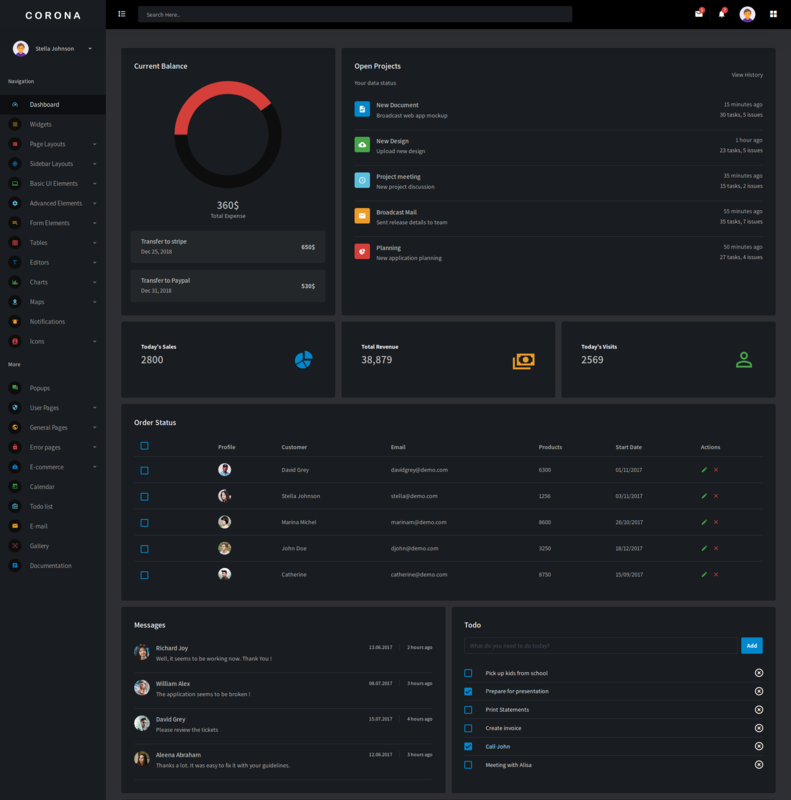 The Equinox Bootstrap admin template comes with both light and dark themed versions. This will make it possible for you to add a unique touch to your business website. The clean, simple, and well-commented code of this template can be easily comprehended. This is why beginners love to use this template. 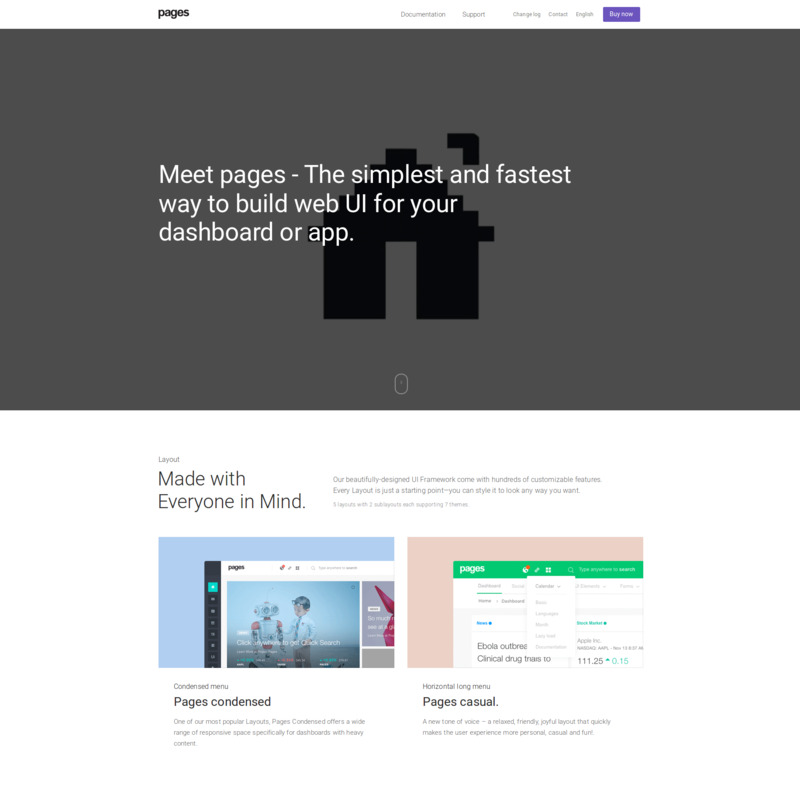 Purple Admin is a responsive admin template, designed using Bootstrap 4. Also, it is available for free. This template’s design is simple, elegant and colorful. It comprises all the essential features for designing the perfect dashboard, or admin panels, project management systems, CRM or CMS, e-commerce systems, regardless of whatever your business needs are. Aesthetically designed, the template is perfectly composed of all components that are well organized within it. One of the highlights of Purple Admin is that it doesn’t contain any of the unnecessary components, which would never come into use. The template can be customized, with ease, to fit into your business requirements. A clean and well-commented code is one of the highlights of Purple Admin that makes it simple and easy to work with it. Purple admin is compatible with almost all the latest web browsers, including Chrome, IE10+, Opera, Safari and Firefox. 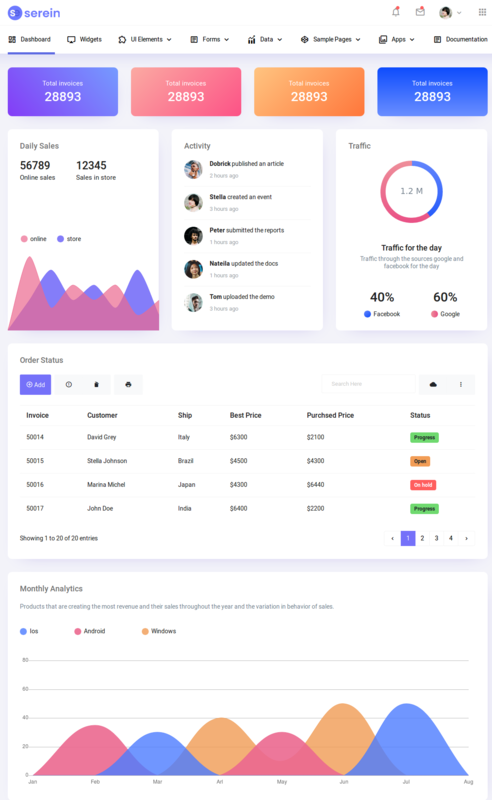 This free Bootstrap 4 admin template was developed from BootstrapDash. You can check out pro version of purple admin template. Finding an excellent Bootstrap admin template with the features that you are looking for can seem quite challenging times. If you are experiencing such an issue, then you should check out the HiliteUI Bootstrap admin template. This fascinating template is highly responsive and it also supports most modern web browsers. Designers who are using the HiliteUI Bootstrap admin template will be able to gain access to multiple numbers of UI components, pages, and widgets. You can bring the desired results to your website without any hassles if you wisely use the above-mentioned tools. Again, Star Admin is also available for free download. 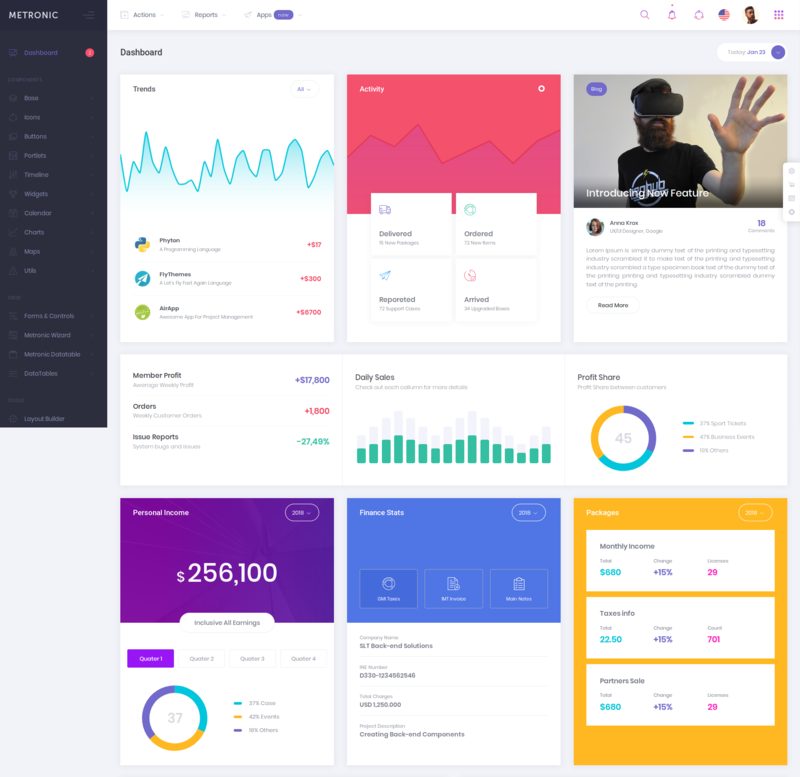 It exhibits some of the features similar to that of Purple Admin – elegant, simple and colorful design; composed of all essential components that are well organized within the template. It supports the creation of admin panels, project management systems, CMS or CRM, and e-commerce systems. Star Admin can be easily customized to fit into your business requirements. Just like Purple Admin, it comprises all the necessary features, but there is no room for unwanted components. Star Admin could be the best choice for kick-starting your project as it has no unessential components and offers a clean and well-commented code, which further makes it easy for you to work with the template. You can check out pro version of Star admin template. 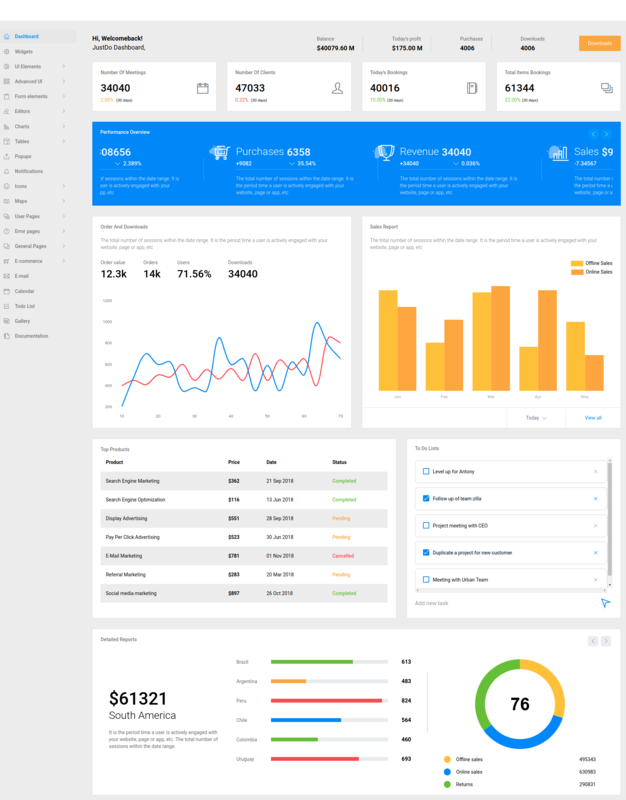 If you are in search of an excellent Bootstrap admin template that offers multiple number of UI components and other handy features, then you will instantly fall in love with the DataVizUI admin template. 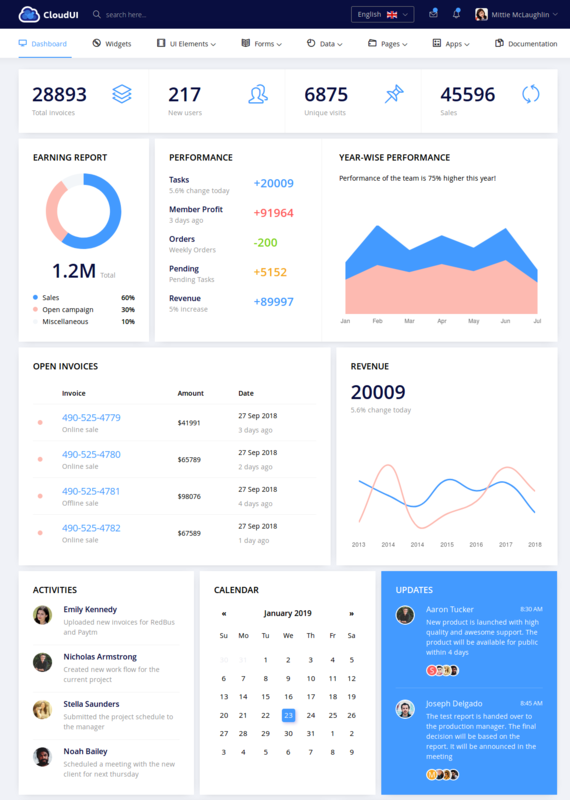 This highly responsive and well-designed Bootstrap admin template is built with the help of Bootstrap, SASS, jQuery, HTML5, and CSS. The well-commended and clean code of this template can be easily comprehended. In fact, even the ones who are new to the world of website designing will be able to do that with ease. More than 10 pre-built widgets and over 15 essential UI elements are available with this template. 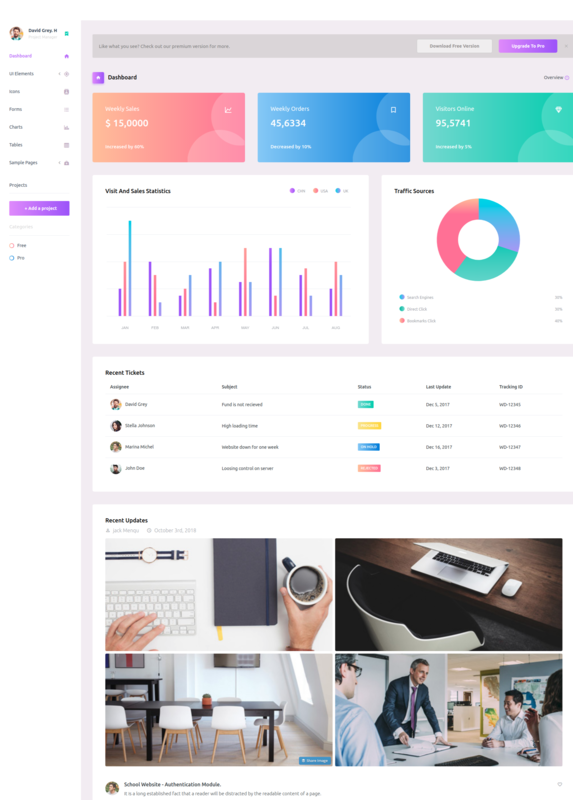 Corona is another excellent option available to website designers and developers who are looking for a stunning Bootstrap admin template. One of the best things about the Corona admin template is that it is highly responsive, which means that your website will look great when viewed from both mobile and desktop devices. If you choose the Corona template, then you will be able to make use plenty of handy UI components and several other features. In addition to that, this template also comes with a light and dark version. This will in turn help you to make your website look even more elegant. 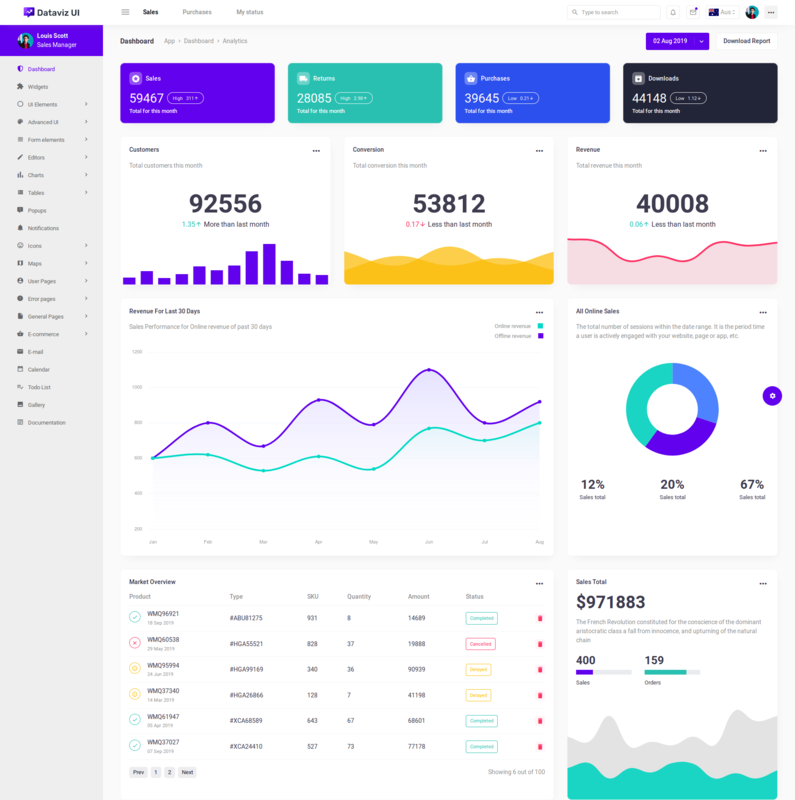 The highly responsive and easy to use Basic Bootstrap admin template features a fascinating collection of UI elements and other essential components that will enable you to easily build and customize websites. One of the most attractive things about the Basic admin template is that it comes with both light and dark versions. This template boasts a simple and modern design, which has the ability to instantly capture the attention of website visitors. More than 10 pre-built widgets and over 15 UI elements are available with this template. The cross-browser compatibility and high responsiveness of the template are also worth mentioning. Website designers and developers who want to make their website look good on both mobile devices and desktop should consider settling for the Stellar Pro admin template. The high responsiveness of this template will enable you to ensure that. The clean code of this template is relatively a lot easier to comprehend. If you are choosing the Stellar Pro Bootstrap admin template, then you will gain access to multiple numbers of UI elements and widgets. This excellent template also comes with vertical and horizontal layouts and it also has both light and dark versions. 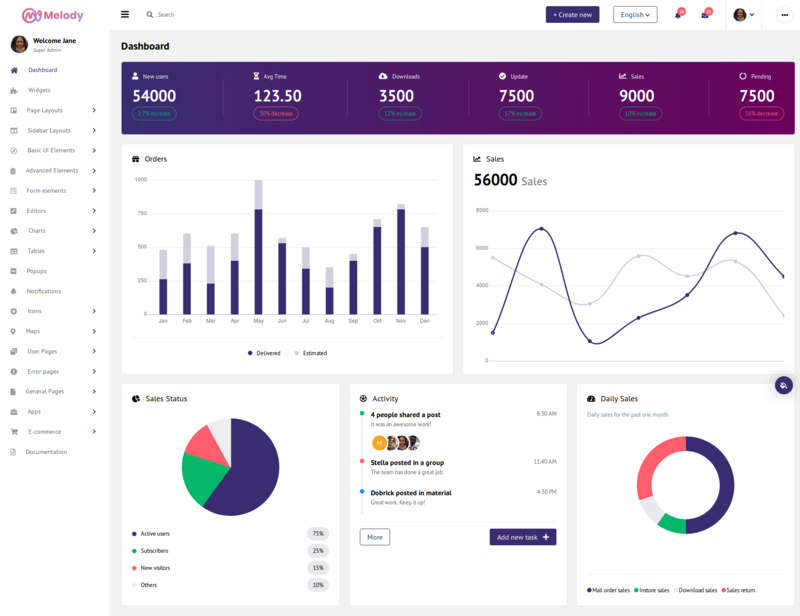 The multipurpose premium Bootstrap admin template, JustDo was built by using jQuery, CSS, HTML5, and the Bootstrap 4 framework. This fully responsive admin template offers an abundant number of handy plugins and excellent UI components to users. The easy to customizability and breathtaking design of the JustDo admin template will surely ensure a fine experience to developers including the ones who are new to the world designing. If you opt for this Bootstrap admin template, then you will be able to select form elements from four unique choices. In addition to that, plenty of tables, charts, error pages, general pages, user pages, and more are available with this excellent Bootstrap admin template. The user-friendly and highly responsive Fily Bootstrap admin template contains a fascinating collection of useful components and elements. The Fily Bootstrap admin template, which is built with ScSS, jQuery, HTML5, and CSS is easy-to-customize and highly flexible. Users who choose this Bootstrap admin template will gain access to multiple numbers of layout and color theme options. Another highlighting feature of the Fily Bootstrap admin template is its responsiveness. The fully responsiveness of this template will ensure that your website will look great on different devices. 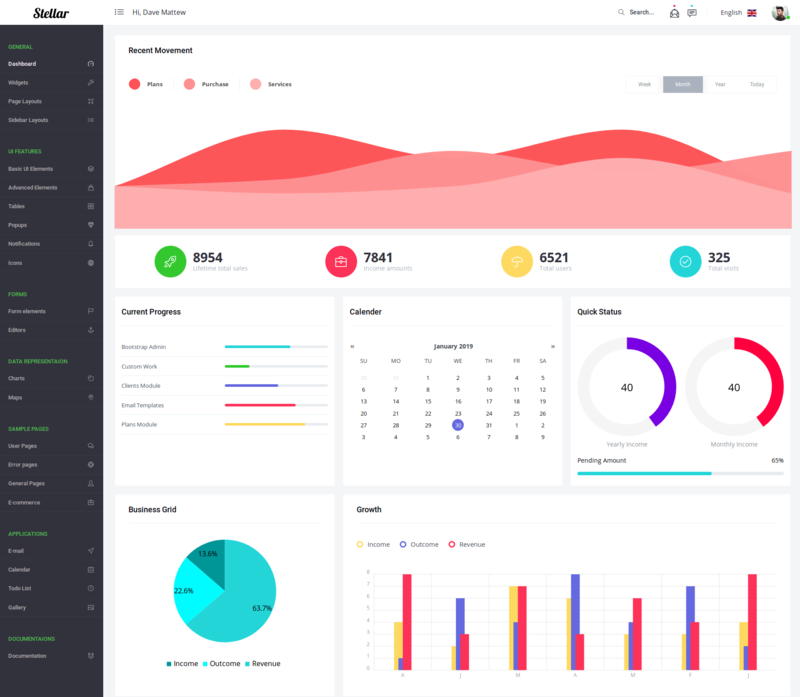 In addition to that, this excellent Bootstrap admin template comes with over 5 advanced UI elements and more than 10 UI elements. A premium bootstrap admin template – Serein Admin serves multiple purposes and comprises almost all essential features. This fully responsive bootstrap admin template also comprises a vast depositary of reusable UI components and plugins. While using Serein Admin template, there is nothing to worry about the usability or performance of the applications created using it. Serein Admin dashboard is compatible across most of the web browsers and devices. You can use Serein Admin to create a variety of web applications, including e-commerce backends, SAAS, CRM, CMS, web application backends, custom admin panel or admin dashboard. As it followed flat design guidelines, the designs created using it are clean, user-friendly, sleek and intuitive. Melody Admin is a fully responsive Bootstrap admin template, which is built using HTML5, JQuery, CSS and Bootstrap 4. Being a premium Bootstrap admin template, it offers a variety of features and comes with a collection of reusable UI components and plugins. 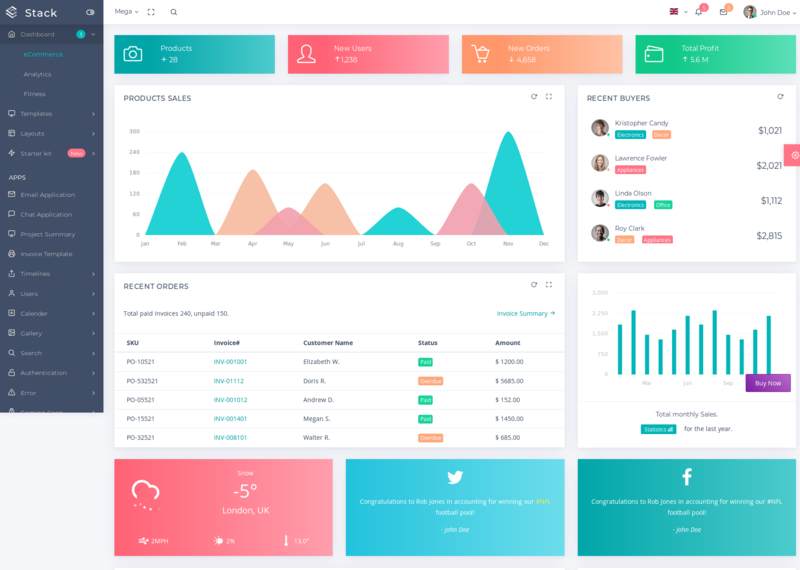 One of the highlights of Melody Bootstrap Admin template is that it helps in enhancing the usability and performance of applications developed using this admin template. It is compatible with almost all the major web browsers and devices. Also like Serein Admin, you can use Melody template for creating a wide range of web applications, such as custom admin panel, e-commerce backends, SAAS, CMS or CRM. It will help in speeding up the development process, thereby helping you save a lot of time and money. Another highlight of Melody template is that it can be easily customized to fit into your needs. This fully responsive Bootstrap admin template serves multiple purposes and comprises a wide variety of features, reusable components, and plugins. It is built using HTML5, JQuery, CSS and Bootstrap 4. It is compatible with a variety of modern browsers and devices. The designs rendered using CloudUI Admin are clean, intuitive, sleek, and user-friendly. Some of its features include ready-to-use plugins, fully responsive pages and over 100’s of UI components. Metronic is a well-known and widely used admin theme. Since its launch in 2013, it has been seen to that it is updated regularly, which is why it has become one of the best-seller admin templates. Like Material Pro, it is also popular across the ThemeForest marketplace. If you do not have much time to experiment and check what works best for your needs, here you go – choose Metronic – as it has already reported above 53,000 sales and stars with an average rating of 4.89 out of 5 because people have already tried and experienced its awesomeness. Another reason for its popularity is that you do not need to worry about redundancy in design, as the admin panels offer a visually distinguished appearance when compared with the other projects, which implement this same theme. Customization is another highlight because it has seven different admin themes – which you can customize on the basis of your project’s requirements – making room for an appealing user interface. You can enjoy the goodness of around 1,000 in-built pages and over 1,500 UI features, which makes the entire process easier, speeding up the development. The main admin themes comprise distinctive configurations, such as material design options, which include the one with rounded corners, a right-to-left text mode, Angularjs version and so on. Some of these designs are unique as they exhibit optional horizontal menus, different sidebar styles and much more, unlike the other admin templates. Similar to Codebase, the Metronic admin template is also responsive, which means that it is compatible with devices of different screen sizes. Moreover, since it gets regularly updated, it works well with the latest versions of tablets and smartphone devices, as well as browsers and operating systems. The dashboard also contains a collection of plugins, which ensure that the theme is up-to-date and trendy. 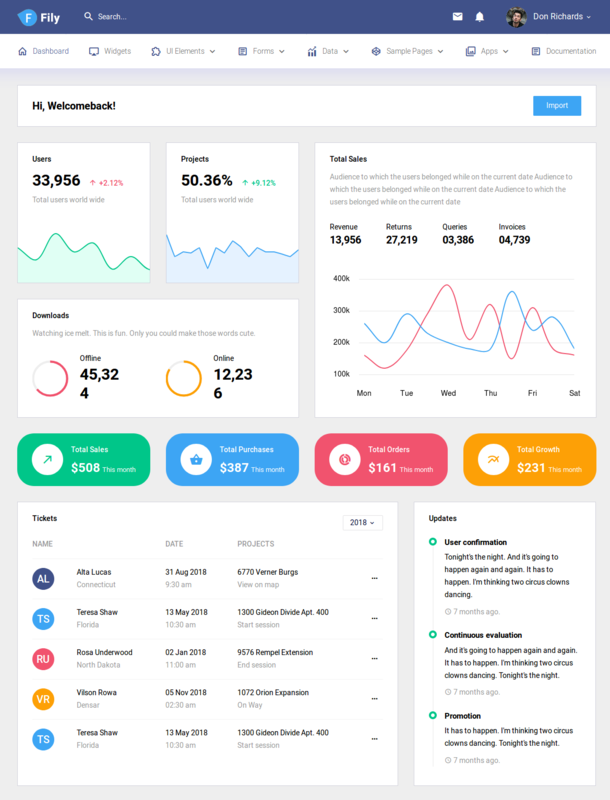 As we have already discussed, Metronic is one of the most modern admin templates while also ‘Pages’ is another bootstrap admin template, which offers help with creating modern dashboards. 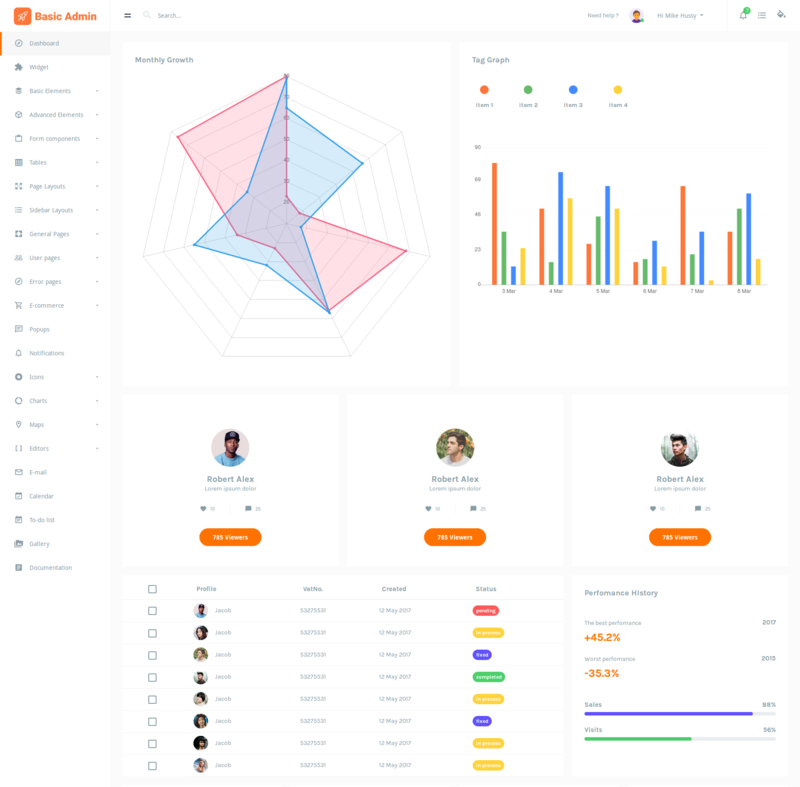 Speed and time are two critical and determining factors in any design project, and Pages was designed with an aim to create a dashboard user interface in a simpler and faster way. Even for beginners, Pages is a great option as it comes with plentiful useful and customizable features. If you have plans to go with your own unique design, then you can start with the layouts included in the ‘Pages’ package – go to ‘settings’, where you have the option to choose from a wide range of menu types, module layouts, and color skins. The animation effects that Pages offers is another highlight, as this is the most important aspect from a visual perspective. With this, an instant feedback can be sent to users requesting to complete an action or whenever there is something they are required to do. It comes with a power-packed library, comprising of the most sophisticated icons, which would light up your UI design. Regardless of the device or screen size on which it is being viewed, the custom dashboard will look awesome as Pages is mobile responsive and retina-ready as well. The flexibility that it offers for displaying content within your dashboard is appreciative – for it ensures that an intuitive approach is followed to showcase only the specific data that the user wishes to view. The wide variety of widgets it offers include a form builder, graphs, charts, sales and stock trackers, and an interactive calendar. It also provides a wide range of in-built page templates, such as error pages, lock screen design, gallery pages, login pages, and registration pages. Online documentation is always available for your help if at any point of time you are struck while working with ‘Pages’. The highlight of Stack is that it offers around seven supple dashboard designs that are all good to go. All you have to do is download Stack and choose one of the built-in designs, which you can customize to build your own custom-made dashboard UI. Since Stack allows you to personalize every single facet of your UI, which means that you are in complete control of your dashboard’s visual appearance. What more do you need? With Stack, modifying headers and footers is pretty much easier, while creating commissioned forms and custom color schemes. Stack offers animations to help you make the graphs and charts on your dashboard more visually appealing. The advanced search feature further helps the users to instantly locate whatever they are searching for. Creating a custom dashboard with Stack is even easier as you do not need an uninterrupted internet supply – the offline builder tool takes care of the process even when you are not connected to the internet. Stack can work with a wide range of devices, screen sizes, resolutions, and browsers – as this admin template has been specifically designed to ensure a great deal of compatibility. It implements intuitiveness when displaying content as the responsive layouts are configured to showcase content depending on the device across which it is being viewed on. This could mean hiding certain sections on screens with smaller sizes or rearranging the order of components to enhance user experience. The above-listed Bootstrap admin templates are handpicked from the most popular ones, though the list goes on. We have specifically listed out these for the wide range of features they provide and the ease of setting up that they come with, thereby helping to speed up the development process. For any further queries or suggestions, please comment in the comment box below. Thanks for this wondrous post, I am glad I observed this website on yahoo. We are glad that you find this article useful.